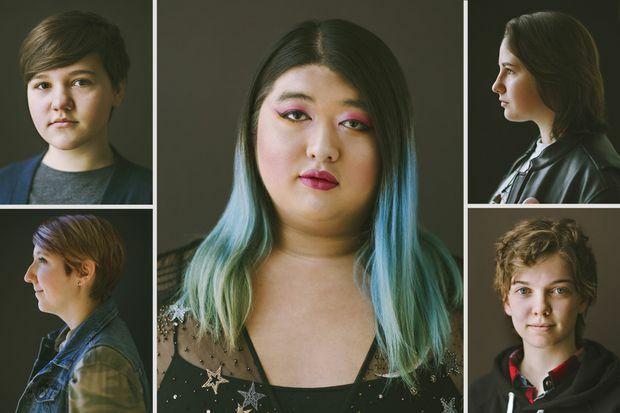 Elias Gallant, Nicolas Saville, Leon Tsai, Kai Kuelz and Quinn A. Brohman are five trans youth in the Kitchener-Waterloo area. Hilary Gauld Camilleri has been a photographer in the Kitchener-Waterloo (K-W) community in Ontario for nearly a decade. During that time, she began to notice ways the families and individuals she worked with were changing. Hannah Yoon, on the other hand, was new to the area as a photographer and was just starting to explore the community as a photojournalist. Both have different approaches to photography and wanted to collaborate to highlight gender-identity issues in the community. This project is the result. It began with a teen named Leon, whom I – Hilary – first photographed as part of a local youth theatre group. Leon came to my studio over the course of the following two years for headshots. Within that time frame I saw Leon transition from a cis-presenting young man, to a young man wearing a beautiful green sweater and earrings, to a young woman in a dress by our third session together. Leon is the first transgender youth I photographed and since then I have had the opportunity to work with many other transgender youth. After some discussion, Hannah and I both recognized that transgender youth stories have not been highlighted across the country. We found five brave faces. As we spent time photographing each individual, we were able to hear their stories. They consisted of struggles, but also of triumphs. Although some of them are still misunderstood, they have found their place in the community. Some are activists, some have bravely come out to their family and co-workers and others are quietly finding others who are also struggling. In their own fashion, they have each found a way to be unapologetically themselves. These images were collaborative and a way for each youth to own their stories and experiences. 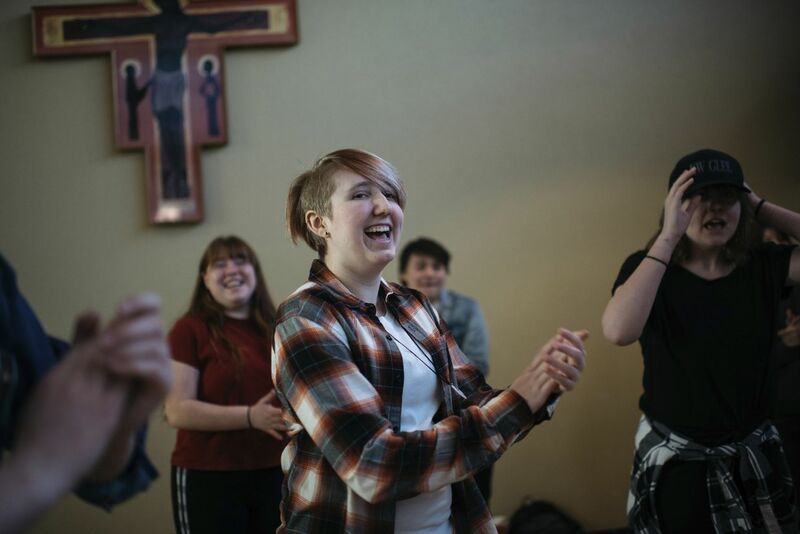 While connecting with each person, we learned how little we knew and understood about the challenges that transgender youth face. We learned the importance of listening to people and their stories. Even though we may not know exactly what they are going through, we were able to gain a deeper understanding of the gender spectrum and how rigid the perception of spectrum really can be. But their resolve is strong. Their challenges are real. Our communities are changing. Spencer Small, a therapeutic counsellor of K-W Counselling, has worked with many LGBTQ youth in the community and has seen a increase in the number of youth coming to the centre. Mr. Small says a major concern for the K-W area is the lack of access to proper health-care professionals who are equipped in assisting transgender folks. Although Toronto is close, the wait lists can be very long, and leaving gender dysphoria unaddressed has substantial consequences, including self-harm and suicide. This project has been incredibly rewarding for both of us. We have great respect and admiration for these five young souls who are showing the world who they are. As with all photography projects, we were challenged on many levels. Fear being the greatest. Fear expressed by some of the families for what their child might face by placing themselves on a bigger stage. Teens who wanted to participate but were afraid to come forward in such a public way. In fact, we had two participants leave the project owing to safety concerns and mental health concerns. And very recently, one of our participants decided they no longer want to be associated with the LGBTQ community due to bullying. Each individual we spoke to longed to be accepted and embraced as a human being. They do not want to be limited by their gender, but rather want to be valued for their humanity. They enjoy art, family, friends and being part of the community. They challenge our binary understanding of the world, and we believe this project will help us to embrace the greater LGBTQ community. Leon gets ready for the day at her home in Waterloo. Leon, now 18, would try on her mother’s dresses when she was five years old. When she first came to Canada from Taiwan in 2012, she started to learn about what it means to be transgender. It has been difficult at times to “pass” in the transgender community because she has not physically or medically transitioned – she has been waiting since 2016, but is not sure when this will actually happen for her. She often gets mistaken for a drag queen or a cross-dresser, which leaves her more vulnerable to being targeted and harassed by strangers. People yell out on the street randomly or will directly ask if she is a boy or a girl. She is often harassed online. Passing becomes a barrier as people think that you’re only truly transgender once you’ve transitioned surgically and once you have female genitalia. Passing shouldn’t matter, yet it still does. Our gender identity shouldn’t need to be proven. Nicolas, left, kisses his partner John Bannister, 18, in Cambridge, Ont. Nicolas will be going into his second year of university at the University of Waterloo this fall. Nicolas was in Grade 8 when he first felt very opposed to being a girl. This was when he first learned about gender-identity issues and the idea of being transgender. Trans is as much of a spectrum as any sexuality. It’s not about just switching sides in the binary, there is a wide range of how trans people express and live according to their identity. Not everyone gets surgery, not everyone dresses like a stereotypical boy/girl. 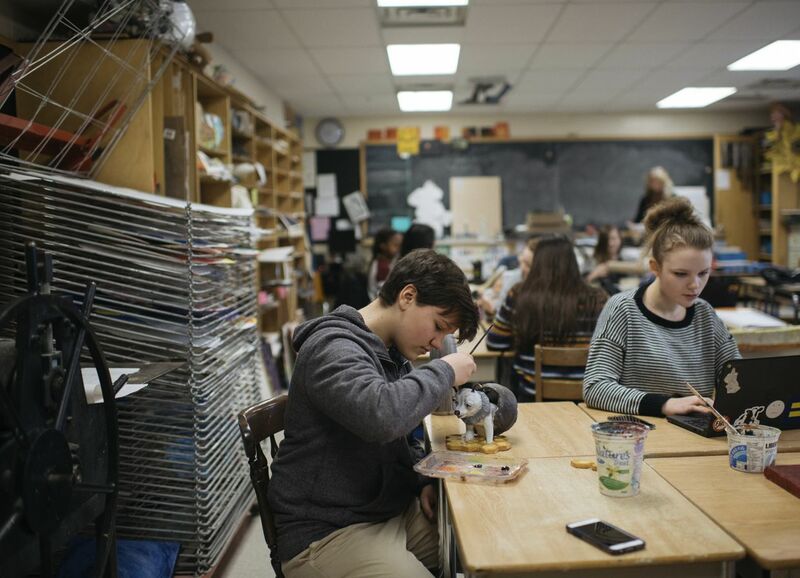 Kai spends time on his final art project in his class at Eastwood Collegiate. Kai started to question his assigned gender in Grade 8, three years ago. 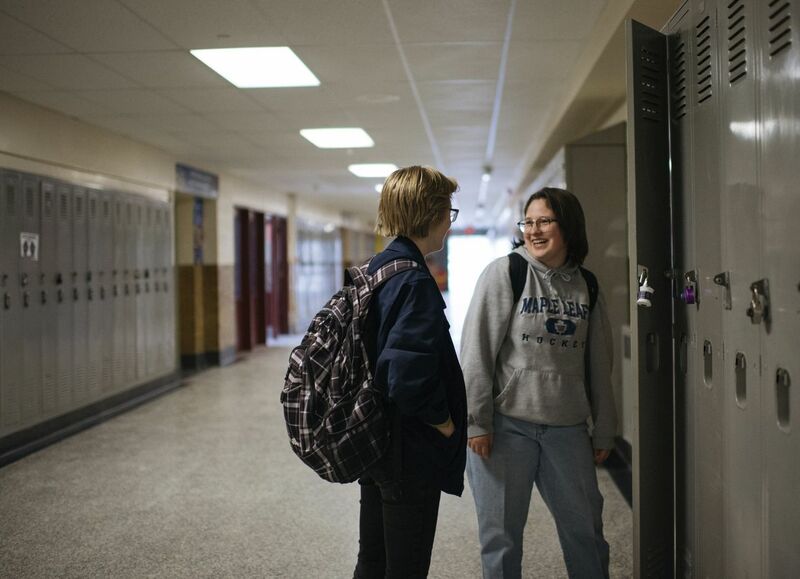 When he moved to a new school for Grade 9, he decided to transition and came out as a boy. Although it has been lonely at times, he’s had a lot of support from his family and friends. Being trans is just an adjective to describe what kind of boy I am. It’s more than just being trapped inside your own body. I’m not trapped in my body, I’m just changing it to make myself feel more comfortable. Quinn, right, spends time with their friend at Eastwood Collegiate. When they were about 13 years old, Quinn realized they were on the non-binary spectrum. Quinn takes birth control to help with hormones. They don’t want to be seen as feminine, but as androgynous. At times, there was a part of them that didn’t feel anything, as if there was a void. Their mannerisms and physical apperance changed to adjust to what they were feeling. Quinn has said people often dismiss them or will intentionally call them by their name assigned at birth, which many trans people call a “dead name.” Quinn’s parents will still do this. I wish the people in my community understood the individuality I carry, and how it makes me unique, comfortable with my own being, and over all just a happier person. Elias practices with their friends at a K-W Glee rehearsal in Waterloo. Elias started questioning their gender identity in 2017, and concluded they were non-binary. Friends, teachers and counsellors have been helpful with their transition. They believe without their school, Eastwood Collegiate in Kitchener, they would not have been able to come out. One of their main concerns is whether they will have fair opportunities for work and employment. They are afraid of discrimination they may face because they feel people are still not accepting of transgender folks. KW Glee Club, a pop rock choir, has been a place for them to fully be themselves without any judgment. I’m afraid that I may lose relationships from people that are very close to me as they won’t accept me for who I am. And there are no words to describe what I am feeling and experiencing which makes it difficult to open up and connect to people on this subject. Left: Kai Kuelz and Elias Gallant. Middle: Leon Tsai. Right: Quinn A. Brohman and Nicolas Saville.